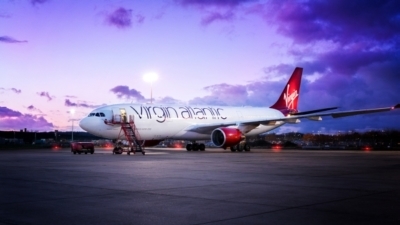 Earlier this year Virgin Atlantic announced that the airline was going to lease four ex-Air Berlin A330-200 planes to replace Boeing 787 aircraft which need a full replacement of their Rolls-Royce engines. Whilst Virgin will be receiving a fleet of new A350 aircraft very soon, the plan is to keep the Air Berlin planes – potentially beyond the initial four year lease, and definitely beyond the anticipated return of the 787s – and use them to expand capacity. These A330-200s are currently receiving a makeover to fit in with the rest of the fleet. 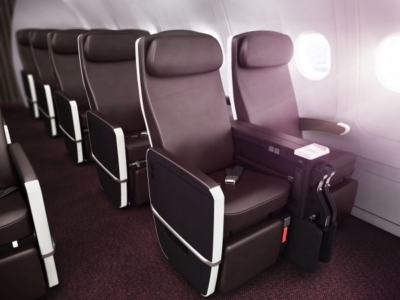 The Economy cabin will be freshened up, a Premium cabin will be added and a new seat layout introduced to Upper Class. To showcase their £10 million investment, Virgin Atlantic hosted a small press event last Friday giving us the chance to experience the new layout through VR glasses – and it did look great. 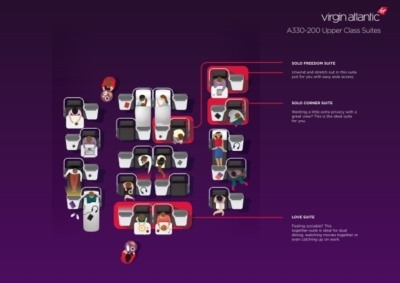 Virgin Atlantic did not have a lot of options for these A330-200 aircraft. Developing a new aircraft seat takes, literally, years. This is because a huge amount of testing and certification is required before the authorities will declare a seat to be safe in all possible emergency scenarios. Virgin does not have the luxury of time here. Virgin Atlantic is introducing a new Upper Class seat on the A330-200 aircraft. This is, for certification reasons, based on the current Air Berlin design and layout, but the seats will be brand new with a number of improvements. There are a total of 19 seats featuring ‘love suites’ for couples as well as corner and ‘freedom’ suites for solo travellers. At present, these aircraft are being used primarily on Caribbean routes (Manchester to Atlanta is the exception) which attract a higher number of couples and family groups in Upper Class and the ‘cosy’ middle seat pairs are apparently not proving a problem. 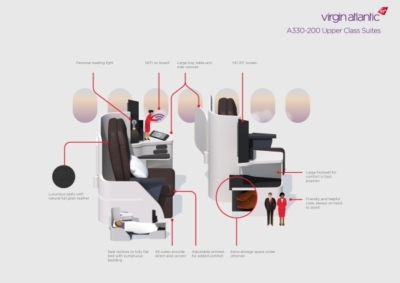 The ‘pair’ seats also make up for the one missing feature on these aircraft which will remain missing – the on-board bar. Virgin is hoping that couples who would sit at the bar in order to be able to chat (the traditional Upper Class layout makes it difficult to talk to your neighbour) will be happy to chat and drink at their seats. One new feature is that the armrests will drop down to become part of the bed, effectively creating a wider space than is currently the case. Storage space has also been increased. 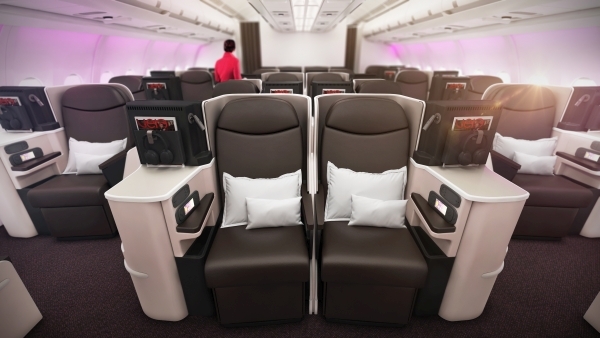 As the Air Berlin planes didn’t have Premium Economy, Virgin Atlantic has chosen to rip out a few rows of Economy seats to make space for a Premium cabin. The seats will be the same 38″ pitch seats that Singapore Airlines has in its aircraft. By coincidence, Rob and I had a tour of a brand new Singapore Airlines A380 yesterday (report to follow) and the Premium Economy seats looked very good. In the Economy cabin, passengers will find the existing Air Berlin seats with new covers and added power sockets. To accommodate Economy Delight seats with the bigger 34″ pitch, some rows will be moved slightly. From November this year the plan is to have the new cabin on flights out of Manchester to Atlanta, New York, San Francisco and Los Angeles as well as from Gatwick to some Caribbean destinations. They should be easy to spot in the timetable as they will be shown as flights operated by an A330-200 but with a Premium Economy cabin. If you are interested in what these aircraft are like at the moment, before the refit, Rob is due to be flying one next week and will report back …. What is the best alternative to the United Airlines MileagePlus UK credit card? So what about the Manchester to Las Vegas route? I tried to book for next year on a normal 747 but it said it was an A330 and there was no option to book PE…is this route going to be the upgraded plane also? I think it will depend on how quickly the planes get done. Singapore Airlines told us yesterday that they are taking 4 months to refit an A380. Anika, I’m Flying out of Manchester after November but to MCO, no word on if the A330 could be utilised on that route occasionally? I wonder how long the old 747s will be in service for….? Also minor typo should it be difficult? Will fix that. You should be ok for November, they only get the first one then. Looks really good – in fact better than existing UC! I found they were quite cramped around the head when lying flat and these seats look more spacious. It is better than BA CW (as was AirBerlin) and I find it slightly amusing that Virgin is fussing so much about a product which they see as a drop-down but BA flyers would see as an improvement. I am also not a huge fan of UC although I am trying the refurbed A330-300 next week. Trust me you do not want to pay upper class prices for these air Berlin planes. We flew on one recently and it’s ended our 12 year association with VA. I have flown them as Air Berlin planes and found it OK. As it happens I am doing both A330-200 and A330-300 next week so I can compare and contrast. 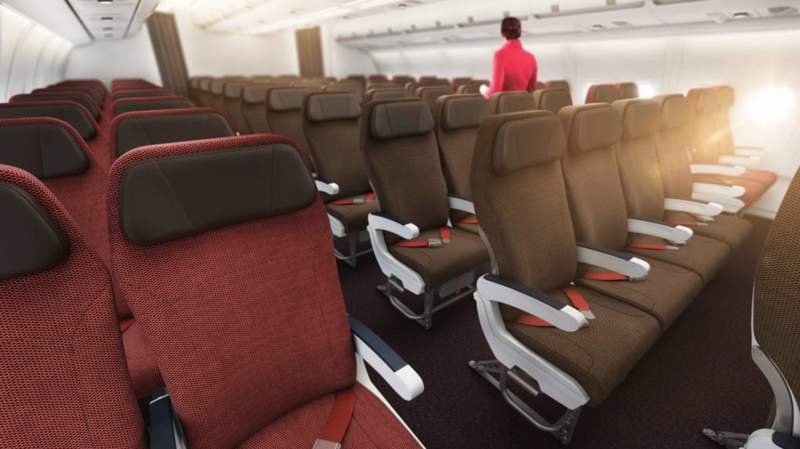 I prefer this to the herringbone seats they currently have on their aircraft as hate the fact you face the aisle and also the fact you have to flip over the seat to make it into a bed. If you travel solo the throne seats are ideal. 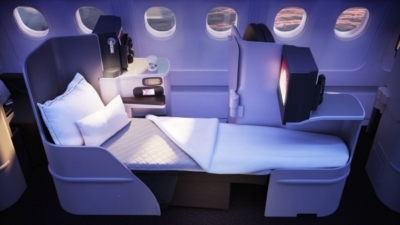 It looks a lot better than the existing Upper Class suite which I found lacking in shoulder width space. I also didn’t like the limited seat recline and the having to get up out of your seat to convert it into a bed! What a palarva! Apart from the lack of aisle access I much prefer the Club World seat. Another one who dislikes UC because of the limited recline, flip bed and lack of ability to sit “next” to a partner. I’ll actively look for these a330’s now when booking. Looking forward, Virgin’s MAN base will consist of 4 x B744 and 2 x A330, so I am guessing the ex-Berlin craft will be mainly down at LGW and doing perhaps the seasonal regionals from GLA & BFS. As feeders in to Delta’s hubs, I’m not sure how losing frequency on JFK & ATL but upguaging to the 747 over winter is going to help the bottom line. I flew virgin for the first time in ages last month. The most irritating thing for me was the flip-bed. You have to commit to flat bed OR seat. In the middle of the night i quite like to “slouch” a bit and watch some IFE but this was not possible without the rigmarole of seat/bed conversion. Off topic: anyone know if we’re likely to see another Dixon’s bonus Heathrow points offer on Apple products soon? Flew on one of these last week back home to NYC. It was supposed to be a Dreamliner and got swapped out just before check in opened – I could tell immediately from seat map at check in. Premium was comfortable, fresh, and because bigger aircraft and cabin than the Dreamliner, it was empty – the entire bulkhead in premium was empty apart from me, and only something like 12 other people in the cabin. Much preferred it to the A340. Upper looked nice too – not a fan of upper normally due to the flip situation and facing inwards instead of towards window, but this looked worth a go. Problem is actually booking it and actually flying it due to virgin constantly doing aircraft swaps! Refurb of the A330-200 doesn’t start until November, and they currently don’t have Premium. Could it of been an A330-300 you flew on? Hmmm! So what about flights being taken on the A330 200 BEFORE November?? You get what I will get on Sunday, which I will cover next week. If you search for the two Air Berlin A330 reviews that Anika and I have done over the years, you’ll also see the seat there. Although I imagine Virgin is less obsessed with serving sprouts than Air Berlin used to be. Oh god the sprouts salad!!! ???????????? Glad I didn’t downgrade the o/b to PE as that’s gone. The 332 Air Berlin UC cabin also has fewer seats. Do check your booking as VS are a bit slap dash in rebooking seats. Any info on pitch and width of the UC seat? Just done a 332. Better than Club World, debatable whether it is better than UC. I am not a fan of UC and I think I will actually prefer the 332 fleet when it is redone. The plane I had today was a bit knackered though.